The Enterprise is a home computer first released in 1985. 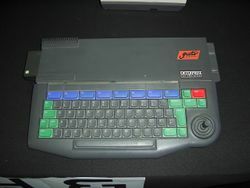 It was first released as the Enterprise 64 with 64 kB of RAM; several months later the Enterprise 128 was released, which boosted the RAM to 128 kB. Despite being a powerful system at the time it was a commercial failure. Pages in category "Enterprise 64/128"
This page was last edited on 22 September 2008, at 23:47.